Chinese Corruption 中共貪污腐敗 - 激爆新聞區 - 城市論壇 - www.forum4hk.com 一個香港只得一個支持言論自由香港論壇討論區 香港論壇討論區 - Powered by Discuz! Corruption in China became increasingly serious during the early period of its social transition, resulting in severe economic losses and huge challenges to China's government institution, as well as gradually becoming socially widespread. Recently, "Characteristics and Development Trend Research on Chinese Senior Officials' Corruption" carried out by Chinese National Conditions Research Center of the Chinese Academy of Sciences (CAS) and Tsinghua University, studied senior official corruption above vice-ministerial level over the past 20 years (1978-2002), discussing its roots as well as the ten principal characteristics of corruption in China. In the period 1987-1992, the number of officials under investigation at provincial and ministerial level reached 110, amongst whom 79 were investigated in the period 1990-1992. However, the number of severe corruption cases, and officials who were given disciplinary measures by the Party, increased by a considerable margin, especially those sentenced. Among 64 senior official corruption cases in the database, 31 cases were submitted to the judicial authorities and given judgments, of which only five were sentenced before 1992 and 26 sentenced after 1992. With regard to the amount of money involved, cases in the 1990s were much higher than those of the 1980s. Before 1992, there had been no embezzlement or bribery case with money reaching 100,000 yuan (US$12,081.7). While after 1992, among 37 cases in the statistical data, there were 27 cases exceeding 100,000 yuan, amongst which 12 cases accounted for over 1 million yuan (US$120,816.84) and four cases accounted for more than 10 million yuan (US$1,208,167.99). 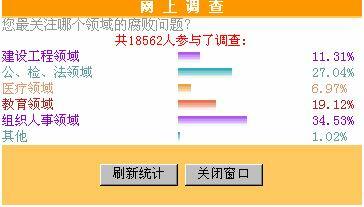 Five cases after 2000 were all above 1 million yuan. Among 54 cases clearly dated, 43 cases began in the period 1988-1995. In the meantime, the Circular of the Supreme People's Court and Supreme People's Procuratorate, released in 1989, declared the central government's determination to severely punish corrupt officials. There was still a high incidence of corruption during this time and it meant that the effective goal of reducing corruption was not entirely successful. Before 1992, severe corruption cases in ministries and commissions accounted for the greatest number, decreasing in the early 1990s but conspicuously increasing by the middle of the decade. Further research shows the difference between corruption behavior in ministries and commissions in the two periods. Before 1992, corruption mainly occurred in the self-management systems of the ministries and commissions. Corrupt officials usually entered economic fields through government engagement in trade and sought to profit by taking advantage of their rights of examination and approval. After 1992, a new corruption characteristic appeared where senior officials colluded with local enterprises, seeking to profit by taking advantage of their position and power. The former mainly consisted of unit corruption while the latter was mostly individual. With regard to the range of corruption, once China implemented its policy of reform and opening up, the incidence of corruption in coastal areas was little higher than that of inland areas, while money involved in coastal area cases was obviously much higher than that of inland. In 1989, the bribery case of Luo Yunguang, vice minister of railways, shocked the whole nation, owing to the group of people concerned, as well as the high-level position it involved. After that, China's prosecuting agencies, at all levels, successively probed a number of new group and gang corruption cases, including many officials above ministerial and provincial level, such as the embezzlement and corruption cases of Wang Baosen (former Beijing vice mayor) and Chen Xitong (former Beijing mayor) exposed by the "Wuxi Xinxing Co. illegal fund raising case" and the bribery case of Wu Wenying and Xu Penghang, two top leaders in charge of textile industry, exposed by the "Kangsai case". 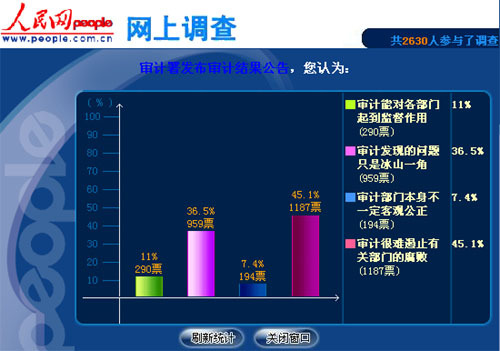 The Xiamen Yuanhua smuggling case involved a greater number of people with two officials at provincial level. Local group corruption cases have been more problematic. The latest case in Shenyang, northeast China's Liaoning Province, involves one official at vice provincial level, four at vice department level, 11 at division level, seven at county division level. They got over 200 million yuan (US$24 million) through illegal practices. Group corruption cases usually resulted from corruption of the first-in-command. Once the first-in-command was corrupt, the group tended to follow that behavior. The average period of case latency probed in the period 1980-1992 was about 1.43-1.44 years. This meant that most corruption cases were exposed almost immediately. However after 1992, the latent period of corruption kept increasing with the average latent period of cases in 1998-2002 reaching 6.31 years. The time span of the cases -- from exposure to official announcement of punishment -- was shown in the average disposal time of 17 cases (before 1992) to be 0.41 years, amongst which 11 had judgment passed within a year, while in 43 cases which had been punished since 1992, the average disposal time was 1.88 years with five cases sentenced that same year while the longest took four years. The research also found that among 17 cases before 1992, corrupt officials were in the same positions when they were exposed as the time they started the corrupt activities. While in 37 cases after 1992, 22 officials were promoted after the first incidence of corruption, clearly indicating a problem in the Chinese official selection system. The official statistical data shows corruption cases were discovered through the help of informant reports. But senior official cases were mainly exposed by other case investigation. Among the 39 researchable cases, 19 cases were exposed by other case involvement, accounting for 80.6 percent, and 5 cases exposed by informant reports, while one case was discovered through confession, with the remaining case detected by suspicion. This shows that supervision of senior officials was weak, either by the Party or by the public. Especially for those cases found at the end of the 1990s, many insiders knew but nobody reported them, resulting in severe social consequence and effect. On the other hand, thorough investigations eventually became a deterrent for the corrupt officials. Bribery has become the main accusation of corruption against China's senior officials. Among the eight cases occurring during 1980-1988, there were three cases involving bribery, where the value was small, of which, one involved Western-style clothes, a recorder and daily items, while the other two cases involved separate bribes of 20,000 yuan (US$2,410) and 12,000 yuan (US$1,446). Among the nine cases occurring during 1989-1992, four cases involved bribery, accounting for 44.4 percent, with an average bribe of about 20,000 yuan (US$2410). While among the 47 cases occurring after 1993, 37 cases were evident acts of bribery, accounting for 78.7 percent. Also, there were six people involved in corruption, accounting for 12.8 percent, with three people involved in embezzlement, accounting for 6.4 percent. Another two people admitted possessing huge property without reasonable resources, accounting for 4.3 percent. Other crimes included misconduct, establishing a secret treasury, and squandering public money. Among 37 cases that occurred in the 1990s, eight bribery cases accounted for the sum of more than 1 million yuan (US$120,482), of which three cases accounted for more than 5 million yuan (US$602,410); seven cases claimed 0.5-1 million yuan (US$60,241-120,482); eight cases claimed 100,000-500,000 yuan (US$12,048-60,241), 10 cases claimed less than 100,000 yuan (US$12,048), but no one case claimed less than 10,000 yuan (US$1,205). Research also found that there was only one case where corrupt officials took bribes from more than 10 individuals among the 24 statistical cases. Of the remainder 23 cases, the average number of bribers per case was 3.0, while six cases had one briber only. Taking bribes from few bribers indicates that most corrupt officials were careful to take bribes by decreasing the risk. Executive interference was the main motive for offering bribes among the 24 recorded cases, which includes getting construction projects, funding, loans, promotion and interfering with law enforcement. Throughout the investigation, it was found that the spouse (usually the wife) and the child played an important role in senior officials' acts of corruption. There were few cases where officials were unaware of bribery taking place within their family. Sometimes, family greed fostered an official's corruption and speeded up the steps for acquiring the illicit gains. Officials didn't always take bribes by themselves, but often used family companies to have their ill-gotten gains "washed" clean. Among 17 cases occurring before 1992, three were found to have family members involved, while amongst 37 cases occurring after 1992, 19 were shown to have family members playing an important role. If having a "love affair" outside marriage in China was a serious social crime in the 1980s, it was much less a problem by the 1990s. Many people thought that having a "love affair" was simply a matter for your private life and not likely to have anything to do with matters such as public corruption. However, cases have shown that having a "love affair" often coincided with the first steps of corruption. In incomplete statistics, among 64 senior official corruption cases, 14 officials were involved in a "love affair", which was considered a conservative number by the research team. The existence of corruption taking place in the last official year of work life, 59, has been largely dismissed by the research report. Seventeen corrupt governors at ministerial or provincial posts were younger than 53, accounting for 53.1 percent, thus problematizing the initial assumptions. In further research it was found that there were 12 cases where officials over 57 years of age were corrupt between 1987-1994, of which 6 cases happened between 1992-1993, accounting for 50 percent. Maintaining that the "59-year-old" phenomenon existed, research indicates that the period 1992-1993 was its height. Thereafter, the Chinese government was quick to promote young cadres, subsequently reducing the appearance of the phenomenon. Processed in 0.037580 second(s), 10 queries, Gzip enabled.